heres one of our early collections of photos. 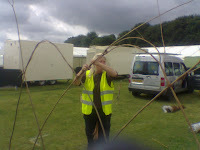 Steve Fuller & Simone Siegan of Willowpool Designs, run unique willow workshops in the Lake District & South Lakes. Willowpool Designs are based in Endmoor, which is a small village just outside of Kendal, Cumbria. 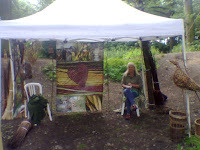 Steve Fuller has been a basketmaker and willow weaver for over 30 years and Simone Siegan has been a willow weaver for over 14 years. Willowpool Designs often use local village halls for their workshops in Cumbria, usually in the Kendal area. Steve & Simone deliver and run workshops all over the country. 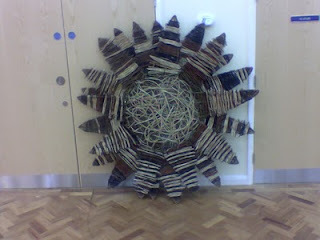 Due to popular demand a selection of workshops for 2010-2011. Workshops can also be organised for groups anywhere in the UK, for a minimum of 10 people. 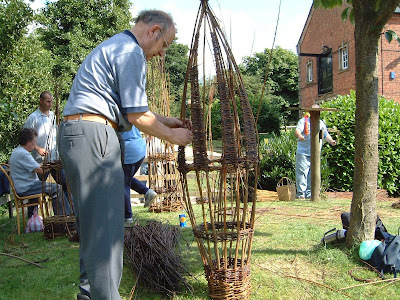 Our fee for workshops is only £65.00 per person, fee includes all materials & two willow artists & preparation costs. All workshops are suitable for complete beginners! A wonderful addition to Christmas, they look great decorated with red ribbons and white lights! 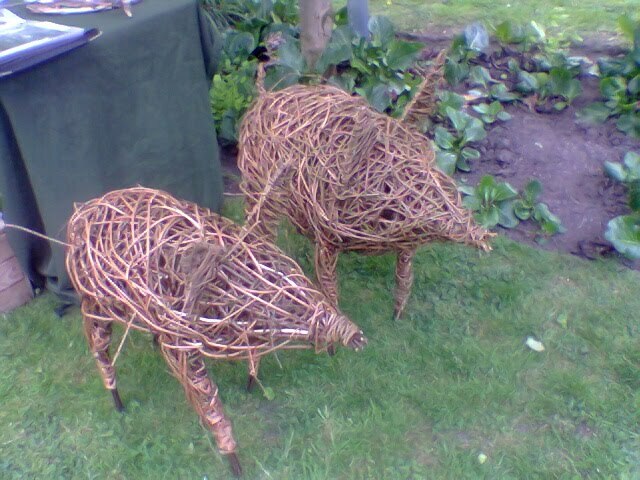 Weave a small deer in a day and impress yourself! Create a small angel for a beautiful Xmas display, or make a few for presents. They look wonderful decorated with white lights, great eco alternative to an Xmas tree! Learn to create a living willow den or fedge. Perfect activity to get yourself through the long winter days! Join Steve & Simone in a workshop to create amazing hearts and stars. Create brilliant presents for yourself or for a valentine day gift with a difference! 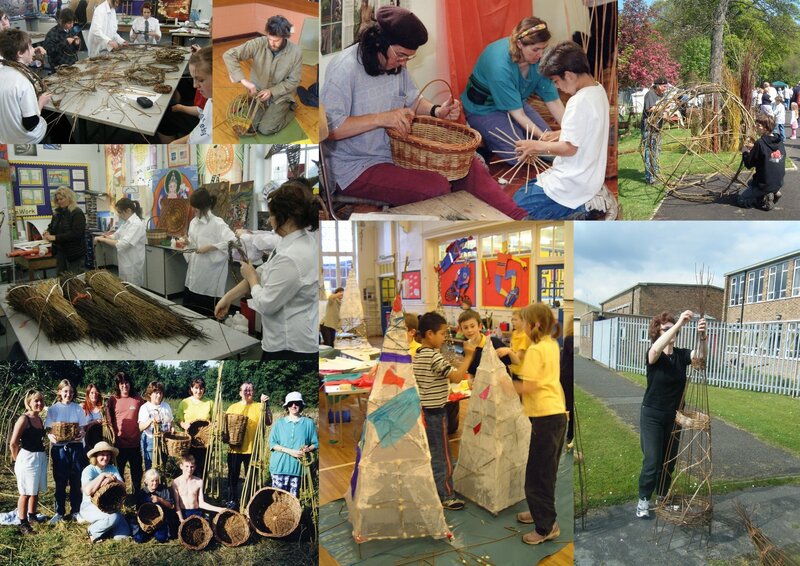 Here is a collage of some of the workshops that we have held over the years. We are going to organise some more workshops for this autumn/winter and will be advertising them at Tatton Park RHS Show. Here is a real garden at Sandsend near Runswick Bay just in case the gardens at Tatton Park make people feel inadequate after viewing all that perfection. If you do visit Sandsend have a look at the willow spiling that is supporting the riverbank. The show starts on Wednesday and we are just hoping for good weather, although we desperately need rain in Cumbria as we are suffering a hosepipe ban at the moment. It rained a lot on Sunday and looks like doing the same today. 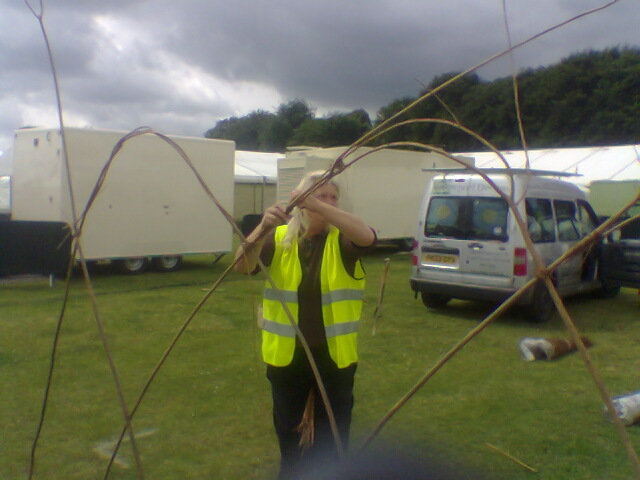 We will be loading all of our willow stuff into the van and car today, dodging the rain and getting ready to finish setting up our stand. Hope that the gazebo is still standing and that the tent that we pitched on the campsite has not collapsed or been raided by kids. We will be demonstration willow scupture (animals and birds) and Steve will be making some baskets. The picture is of our display at Tullie House Museum Open Gardens event, not even a month ago but the weather was lovely, bright and sunny. Anyone coming to Tatton be sure to bring wellies, raincoat and plenty of food as the food prices at the show are quite expensive. There is a lot to see, there seems to be a big emphasis on vegetables and herbs this year from what we have noticed from walking through the showground to our stand. we have had a busy week so far. we were at Bydales School, Marske for 4 days working with students to create a small herd of deer for the school's outdoor classroom. we stayed on a campsite at Redcar which was a bad move as the site was very exposed and the wind was so stong that we were worried that the tent would rip apart in the night. 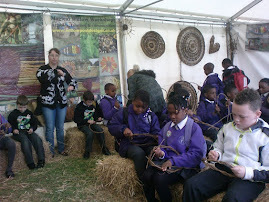 but we did visit some fantastic places after school. we had a great bar meal at Sandsend which is a fantastic place with a lovely coastal valley with lovely cottages with flower-filled gardens. after a sitting in the sun having a beer we travelled on the Runswick Bay which is a fantastic small fishing village near to Saltburn. Saltburn used to be our favourite place in the Middlesborough area but now we are spoilt for choice. Today we started setting up our stand at Tatton Park RHS Flower Show and al;so installed a willow arch in a back-to-back garden designed by Bridge College, Stockport. The weather looks pretty grim for the show but we have our fingers crossed. 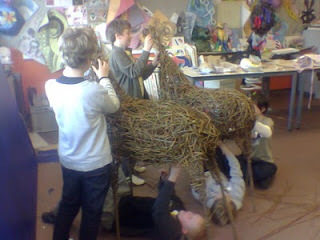 We have had a busy week with school art projects starting at Chapel Stile where we made a deer and a gruffalo. 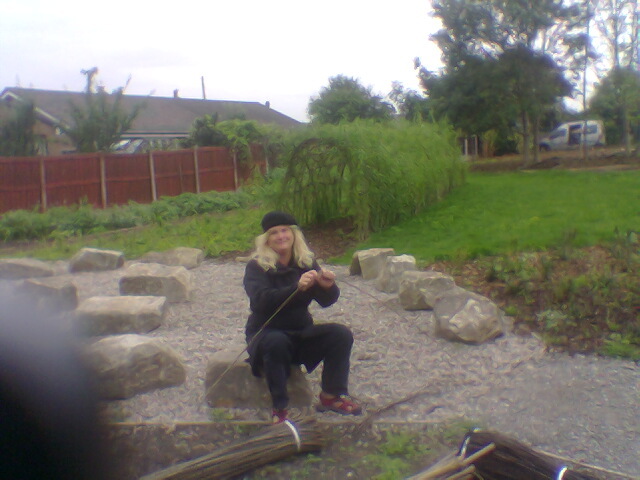 Next we spent a day at a nursery school in Stockport where all the nursery and reception children made willow fish and helped me to make a deer! On Friday we were at a Primary school in Morcambe where we took part in a mini Glastonbury type festival organised by the school - there was lots of music from groups of former pupils, dance workshops, kitemaking, face painting, our willow weaving and singing workshops. The weather was very hot and summery and it was great fun. We stayed in Liverpool on Friday night and went to see Jackson Browne in concert. Fantastic! 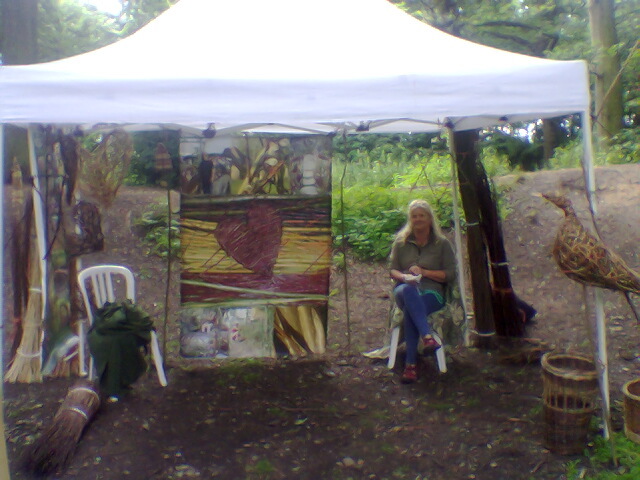 Saturday saw us at a Woodland Open Day in Huyton, Liverpool where we ran willow workshops. Today we are at home enjoying the much needed rain. hope it lasts all day as our newly planted willows need plenty of water.